1. 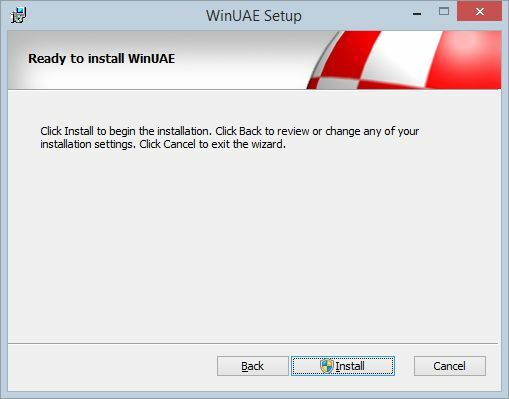 How do I install Winuae? If using Windows Vista or later, click on Allow if the User Account Control dialog box appears. Click on Disk Usage to view disks and how much disk usage is required. 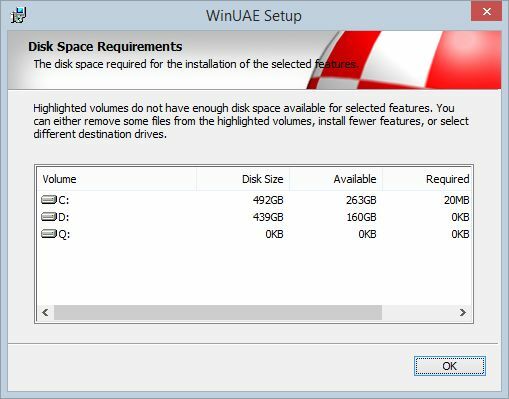 Click OK on Disk Space Requirements. Use the Reset button to change the the component selection to defaults (Install by default). Click Install to commence the installation. C:\Program Files\Winuae\Winuae.exe (for 32 bit machines). 2. Where do I copy the ROM files? If you have one or more kick.rom files which contains the Kickstart you need to place it in a folder in C:\Users\Public\Documents\Amiga Files\Winuae\ (or C:\Program files\Winuae) and then on the Paths screen enter the path to your System ROMS folder and click Rescan ROMs for Winuae to pick them up.The file may end with .rom, .zip, .rar, .7z, or .roz. If you have Amiga Forever Plus or Premium installed, you can find the ROMs in C:\Program files\Cloanto\Amiga files\shared\rom folder (or equivalent). The Kickstart ROM versions are 1.0, 1.1, 1.2, 1.3, 1.4, 2.04, 2.05, 3.0 and 3.1 and AROS KS ROM. 3. Where do I put the Winuae.chm Help File? 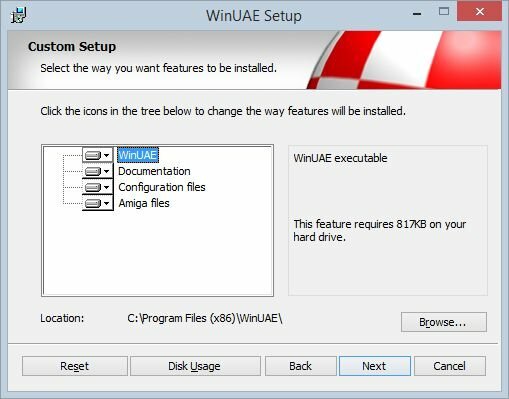 Move the Winuae.chm help file to the same folder as the Winuae.exe program file or in the data location which maybe C:\Documents and Settings\All Users\Documents\Amiga Files\Winuae, which is where the program will pick it up when you press F1 or the Help button. For Vista or Windows 7 users, place it in C:\Users\Public\Public Documents\Amiga Files\shared\rom\. 4. How do I get the PPC CPU Emulation working? You need to install the qemu-uae.dll file in the plugins folder where Winuae is installed. You can download the the PPC Core Plugin from the Winuae site. In Winuae, on the CPU and FPU tab, enable the PPC CPU Emulation option. 5. When I run Winuae, I get an DINPUT8.DLL not found error? You need DirectX 8 or later installed. Run DXDiag.exe to see what version you have installed. Windows 98 comes with DX6, Windows 2000 comes with DX7 and Windows XP comes with DX8.1 or 9, Vista comes with DX10. 6. Will Winuae work with Windows 8? Yes, all recent versions of Winuae will work on Windows 8. 7. I have problems running Winuae on my system, how can I solve the problem? On the Misc tab, enable Create Log file in the Logging section, this will generate a winuaebootlog.txt winuaelog.txt file in the Winuae program folder or in C:\Document and Settings\All Users\Amiga Files folder. You can use this file to see where things are going wrong such as device driver problems, display problems and so on. You can report problems to the EAB Winuae Forum if you are having no luck. 8. Where do I put plug-in files? Copy the graphic filters to a "plugins" subfolder in your WinUAE.exe path, for example, plugins\filtershaders\direct3d. Copy the CapsImg.dll for IPF disk images support to your WinUAE.exe path. Copy the uae_data folder for the drive sounds to your WinUAE.exe path. 9. Where do I put the latest rtg.library? In the Amiga Programs folder you will find the rtg.library, you need to copy this to the LIBS folder onto the Amiga hard disk or Workbench disk. You can do this by copying it into the Libs folder if the hard drive is a directory, otherwise you need to enable 'Add PC on startup' in the Hard Drives section so that you can see your PC hard drive from within the Amiga emulator and use Windows, Show All Files to view all the files and copy the file to your libs folder. 10. Can I run Winuae under Linux using WINE? Yes, you can use WINE (Windows Is Not an Emulator) tool in Linux rather than the older E-UAE. 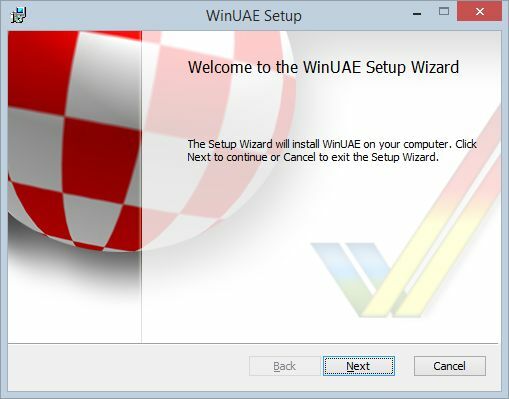 a) Download and run the Winuae installer. b) Copy the kickstart rom file (and rom.key file if using Cloanto's roms) to usual rom directory. c) Install WINE, it may be already installed on your distribution. If its not installed use your software Package Manager to find and install Wine. d) On the Applications menu select Wine, Programs, Winuae and select Winuae to run it under Wine..
11. Can I create localised (or other languages) versions of WinUAE? 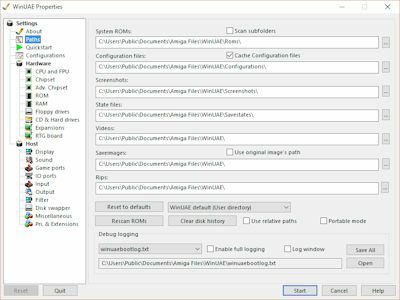 Yes, you need the WinUAE Translation DLL (which matches the version of Winuae you have installed) and a program to edit the DLL file, for example, ResEdit. Copy and rename the DLL to the language you want to translate to e.g. Winuae_French.dll. Open Resedit and open the DLL file. The area you will want to change is the String Table which contains the wording to be changed to your language. Change the word in the box on the bottom left side. When done click on Save. Copy the new DLL to your Winuae program directory and run WinUAE and select the language in the Miscellaneous tab. For older installation instructions see UAE Install.